Ericka Alston interrupted herself in the middle of a sentence and yelled out a name. A boy with long dirty-blond hair, one of the teenagers piling out of the nondescript white van, turned around. His face split into a grin at the sight of Alston. “Miss Ericka!” he yelled, loping toward her. The two met in a big bear hug, laughing. It had been a long time since he had been at the drug rehab facility, and as much as Alston wished he weren’t back, she was glad he was getting help. Soon he ran back to join his peers, but the smile lingered on Alston’s face. She’s the Director of Youth Services, Violence Prevention and Community Outreach for Maryland Community Health Initiatives, Inc. Penn North Community Resource Center. Her title is a mouthful, but the day-to-day means she is responsible for everyone ages 5-26 who walks through the doors of the facility, and she cares deeply about impacting each life. All across the city of Baltimore, women are stepping up and assuming leadership roles in the effort to better the community. In some instances, they lead by necessity, because there are few if any men willing to lead. But mostly, they lead because they, like Alston, want to improve lives. 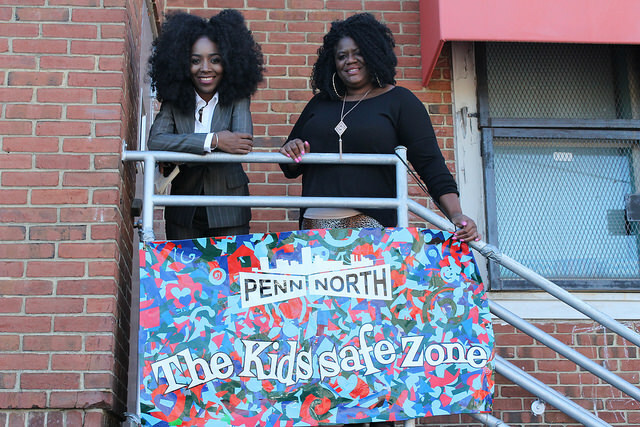 For children age 5-17, Alston created the Penn North Kids Safe Zone, which is run by Tonette Mcfadden, program coordinator, and Essence Smith, recreation assistant. The three women oversee about 50-60 children every weekday afternoon from 2-8 p.m. as well as Saturdays from 12-6 p.m. The Safe Zone is located in Sandtown-Winchester, Freddie Gray’s neighborhood, and Alston said the riots brought to light the sad situation of most kids in the area. They had nowhere to play, she said, other than the streets. Crime statistics in Sandtown-Winchester are above the national average in every category. The murder risk, for example, is nearly double the national average. Nearly every aspect of life — from poverty to unemployment, from life expectancy to teen birth rates — is worse than the national average and Baltimore city’s average. The Safe Zone is not just a recreation center for children, though. It also furthers the mission of Penn North Community Resource Center, which is a substance abuse facility that houses 200 adults between the ages of 18-81. All of these things are important, she said, because children are the front line in the fight against drug and alcohol addiction. Alston’s heart obviously hurt for the children who didn’t think their lives matter. “This is our mini Disneyland,” Mcfadden said of the room. She spoke of the improvements they’ve seen in the children who have been attending the program since they began on June 1, children who were initially very aggressive. “I’ve seen the change in them because when they come in here they’re realizing they can just be a child,” Mcfadden said. Smith spoke of the familial atmosphere of the Safe Zone. Candice Blackwell, director of education programs for Civic Works, has a similar experience. She works to place tutors and mentors in academic settings, and she has a passion for helping youth find and use their voice to affect change. She has often found that women are forced to take a leadership role. Other areas have the opposite problem. Nicole Hanson is the president of the board of Out for Justice, an organization that seeks to help citizens with criminal records reenter society. Hanson said she has found that men often take a leadership role in this area and even look down on the women, assuming they cannot face the same struggles and therefore cannot be as helpful. But the women mentioned also lead because they want to. They have a legitimate interest in seeing their city improved. Blackwell became involved with Civic Works because she saw firsthand some of the struggles youth face. And her passion is in letting youth create their own solutions. The work can be rewarding as well, Blackwell said. Hanson’s participation in Out for Justice comes from an even more personal place. “In 2011, I made a bad choice to be involved with criminal activity, so after that year of me making that mistake I wanted to get back into productive citizenship,” she said. She works with legislation and attempts to change policy, believing that individuals can have an active role in changing the legislative structures that often hold them back. Ultimately, the women of Baltimore are trying to change things because this is their city. This is their home. Smith, who grew up in Sandtown-Winchester and is now actively involved in trying to better it, said outsiders need to look a little more closely to see the appeal. And that is what makes it all worth it.